Well the clocks changed this weekend so the long dark nights are here and although it may be unseasonally mild at the moment cold, wintry weather probably isn’t too far off. I don’t like winter. I’ll admit it has it’s moments. I do love those cold, crisp days where the sky is so blue and frost has touched every surface making even the most mundane of objects look beautiful. There are the birds that visit my garden, birds that for the rest of the year seek their food from other places. 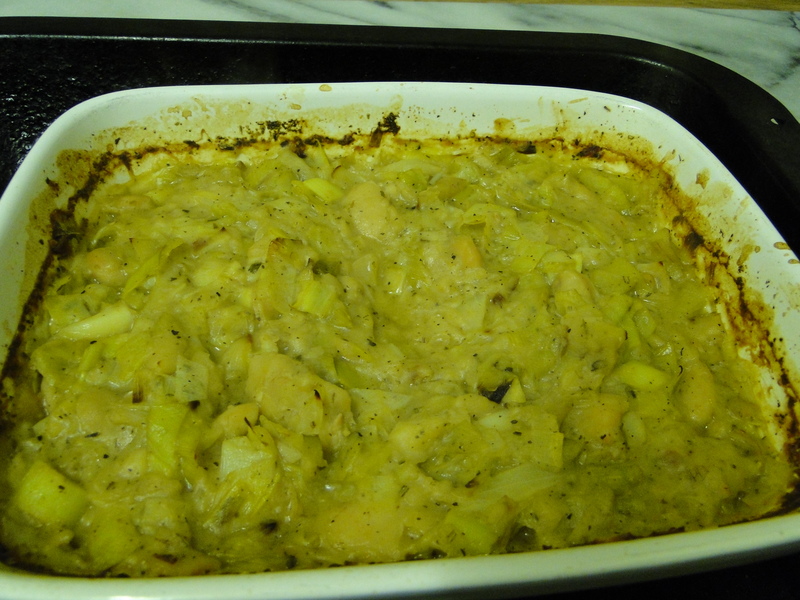 I love the lights and decorations of Christmas and the warm hearty stews that my body craves. But, and it is a fairly big but, I hate being indoors. I get restless, I’m an outdoors girl at heart. Much as I love snuggling up in front of my woodburner, given the choice I would swap it like a shot for a warm day in my garden or on my plot. I don’t do being confined in my house all day very well, as Wellyman will testify. Wellywoman doesn’t want to hang up the wellies for long. So what can I do to get through the next couple of months before the days start to get longer, bulbs start to push through and Spring sunshine lights up the sky. Well I don’t want to wish time away. I, like many people, utter the phrase ‘there’s never enough time in the day’ on a frequent basis. Well I’m going to make a list, a Winter list of all those things that I say I never have time for and I’m going to see if I can use these dark nights and inclement days to do them. (When I say I haven’t time for them I think what I mean is I would just rather be doing something else i.e in the garden or on the plot). So rather than grabbing packets of seeds that take my fancy at the garden centre I’m going to study my seed catalogues this year and come up with a proper plan of what to grow. I’m going to spend time planning my allotment so that I get maximum efficiency from the space next year. I’m going to go through my old seeds and anything I don’t want, I’m going to donate to my local community garden. I’m going to go through my cook books and try out new recipes. 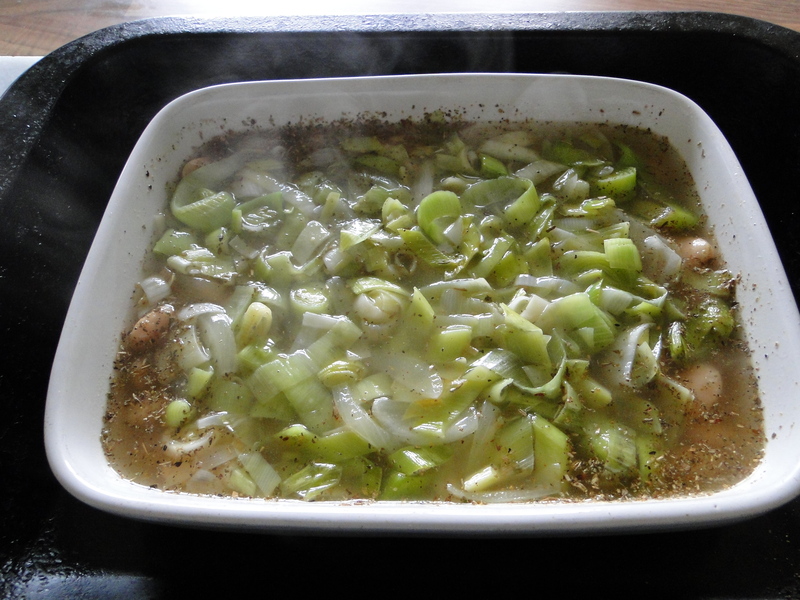 Most people only cook a few recipes from each cook book they own and I’m no different, so I’m going to add a few more tasty meals to my repetoire. And finally I’m going to learn a craft. I would love to able to capture my love of all things plant-like in some way. At the moment I’m thinking linocuts. I love Angie Lewin, an artist who is inspired by nature. So I’d like to give something like that a try. So, hopefully these should keep me busy and keep the Winter blues at bay and then it won’t belong before snowdrops and daffodils are on their way. Just come back from an enjoyable visit to Holt Farm in North Somerset and their ‘Seedy Sunday’ event. 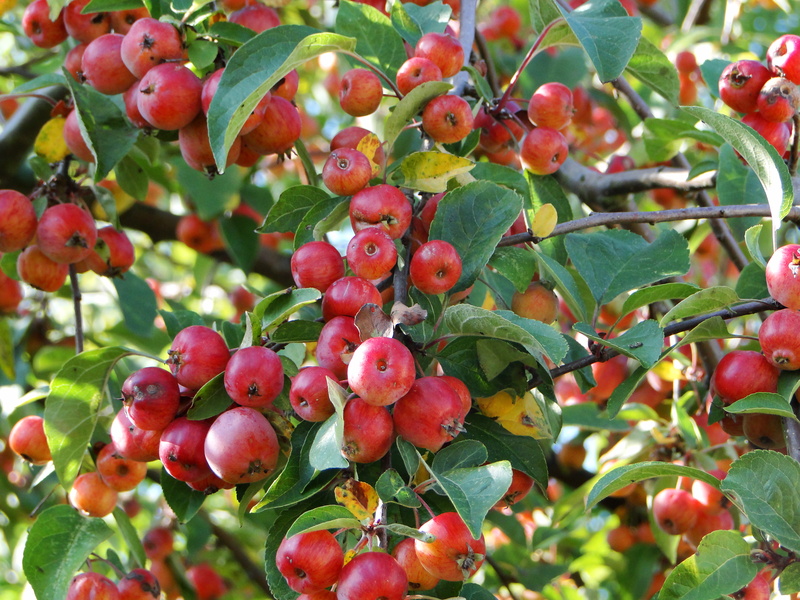 The six and a half acres of garden are one of only a handful of ornamental gardens to be certified organic by the Soil Association and is owned by the family behind the Yeo Valley dairy business. 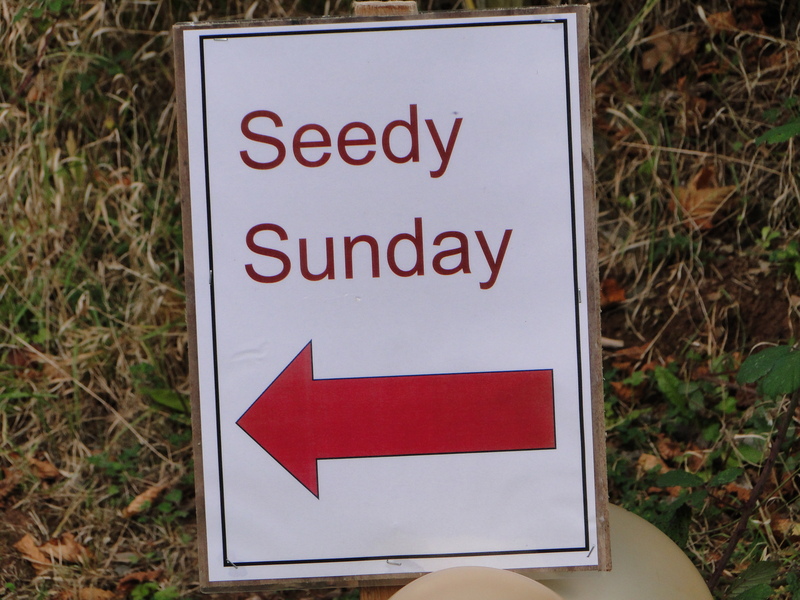 The ‘Seedy Sunday’ run in conjunction with the Heritage Seed Library is an opportunity for people to swap seeds and pick up unusual varieties. There were also local plant nurseries attending, although I managed to resist this temptation. The first ‘Seedy Sunday’ was held in 2002 in Brighton, the idea being that people could get together and swap seeds. The idea took off and has spread to other parts of the country. 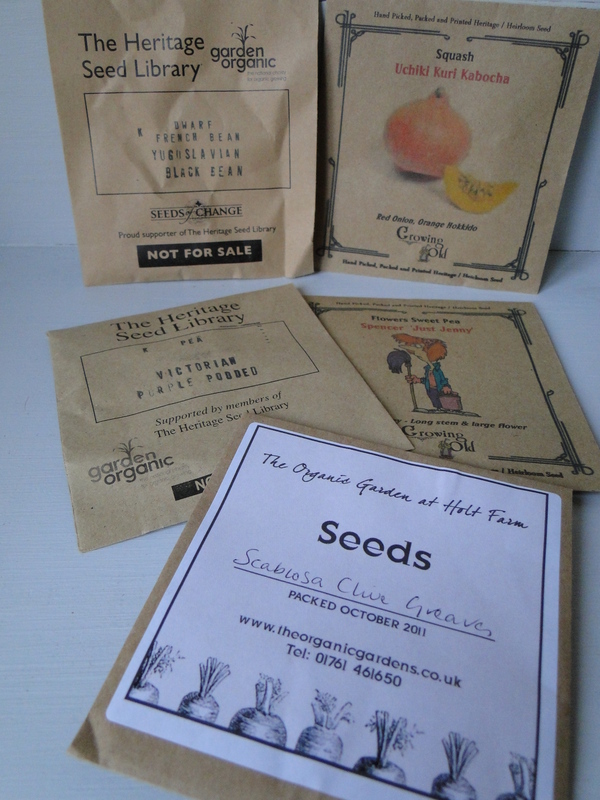 I didn’t take any seeds along to swap because my spare seeds are being donated to a local community garden this winter but I did make a donation for several packets from the Heritage Seed Library and bought some other seeds from a local nursery, Pennard Plants, that had a stall at the event. I came away with a packet each of Uchiki kuri squash, Victorian podded peas, Yugoslavian black bean (a dwarf french bean) and some Sweet peas called ‘Just Jenny’. The Heritage Seed Library is part of Garden Organic which used to be the Henry Doubleday Research Association. It aims to protect old varieties of seeds, mainly from Europe, that are not on the EU’s approved seed list and because they are not approved by Europe it is illegal to sell them. To get around this problem you can go along to events like today and donate, swap or become a member of the HSL for £20 a year and then you can choose up to 6 varieties and swap for other seeds. I was mainly interested in visiting the seed swap but the gardens were an added bonus. The gardens at Holt Farm are contemporary in style, with a gravel garden, use of grasses and beautiful sculptures. 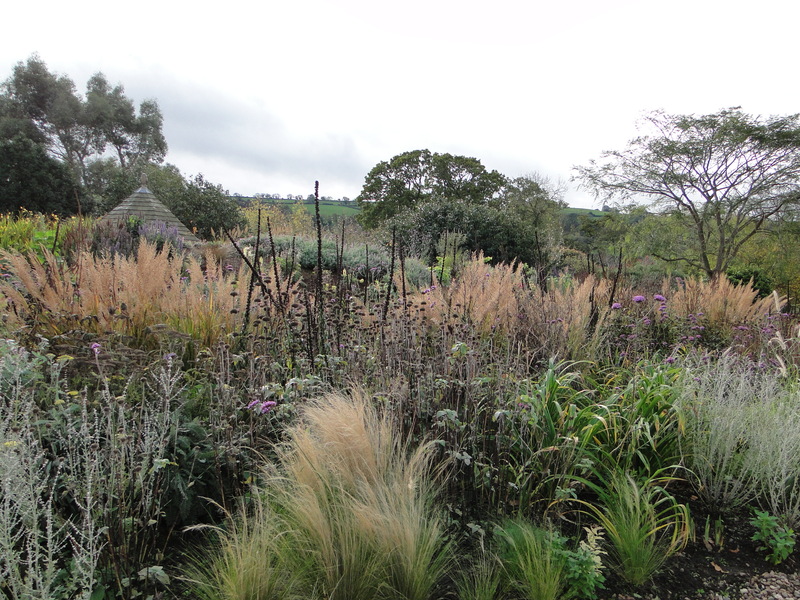 This strangely mild autumn that we are experiencing meant the gardens still looked beautiful with the structure of grasses and seed heads. 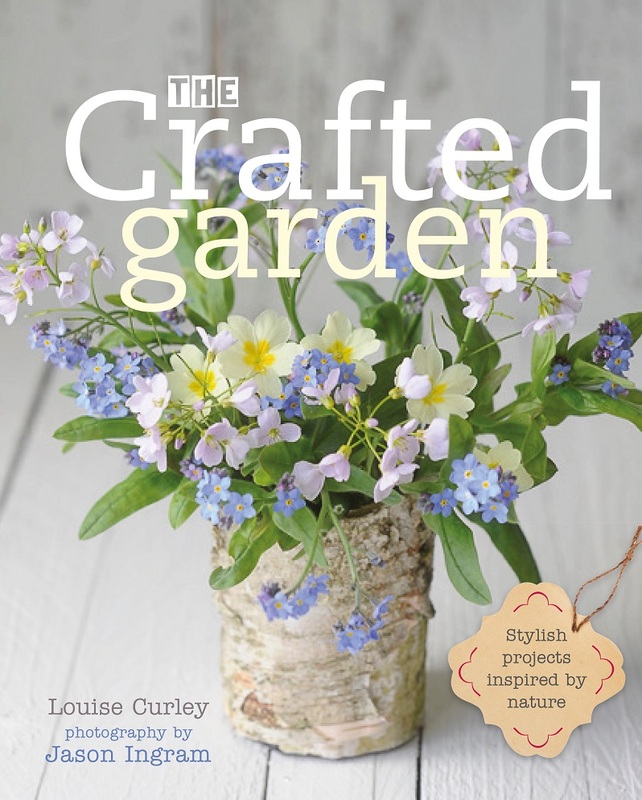 There was a wildflower meadow with coreopsis, cornflower and ammi still in flower and a cutflower garden with dahlias, cleome and scabious blooming and an ornamental veg garden. The garden is still a work in progress (what garden isn’t) with new sections such as a woodland walk that will take a while to reach maturity. 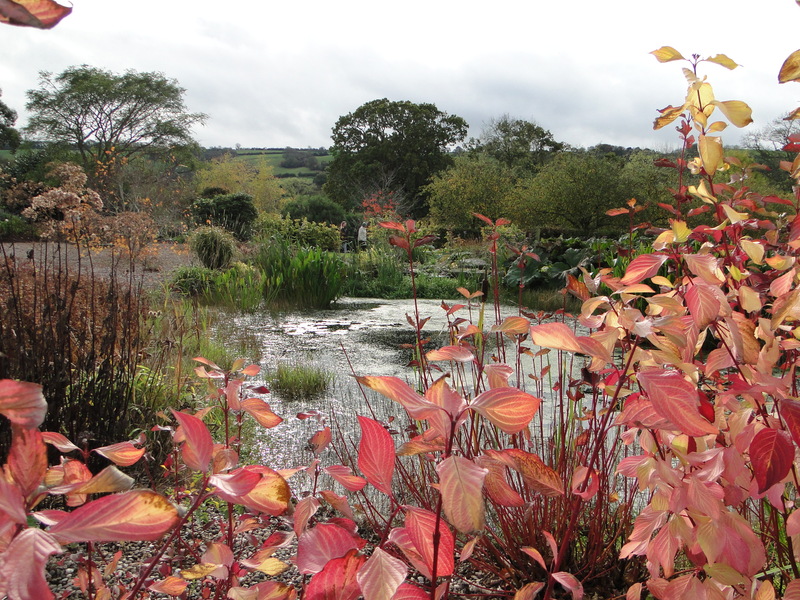 I would certainly visit the gardens again, especially in late summer when the gravel garden will look at it’s best. The location is beautiful, at the foot of the Mendip Hills, overlooking Blagdon Water. I loved the attention to detail in the garden with the beautiful bespoke iron gates and sculptures. Always a bonus is an excellent cafe and I would certainly recommend the food at Holt Farm. So all in all a great day out. 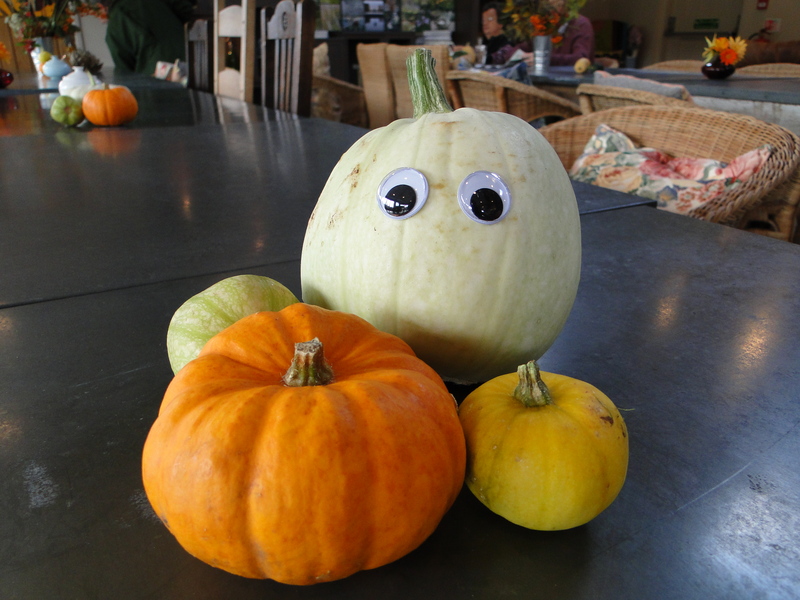 For more information on Holt Farm go to http://theorganicgardens.co.uk/, ‘Seedy Sundays go to http://www.seedysunday.org and the Heritage Seed Library go to http://www.gardenorganic.org.uk/hsl/hsl.php. 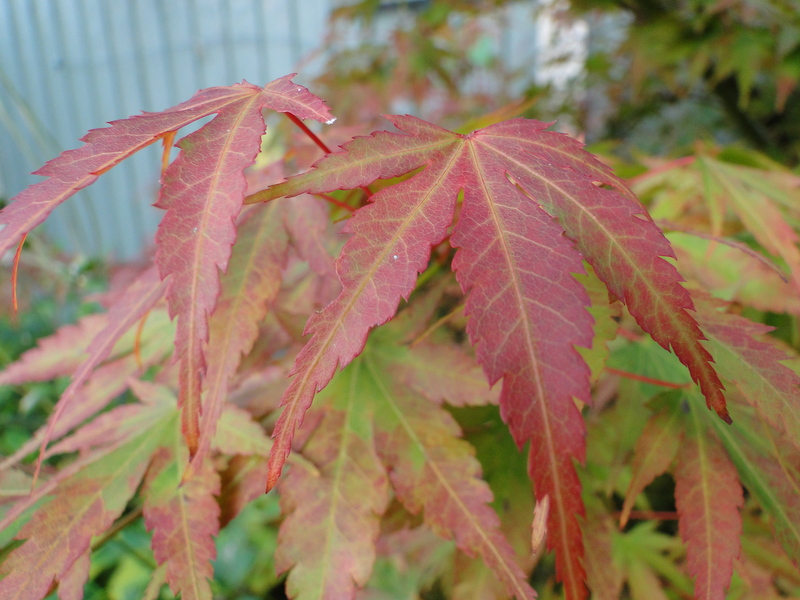 Thanks to Christina at myhesperidesgarden for inspiring me to look at the foliage in my garden. I have to admit I am a flowers kind of girl. I’ve never really been a fan of the minimalist, lots of green, gardens. I can appreciate the calming influence of green in a space and also how it provides a backdrop for flowers to show off but I just find these, so-called tasteful gardens, a bit boring. When there are so many plants and more importantly plants that produce flowers and fruits why would you restrict yourself. It was only really when we bought our first house and I had my first garden that I realised that foliage too, could be beautiful and interesting. It seems that Autumn is the season for foliage. Leaves turning colour as the daylength shortens and the leaves stop producing chlorophyll, so that a rich palette of colours is displayed. 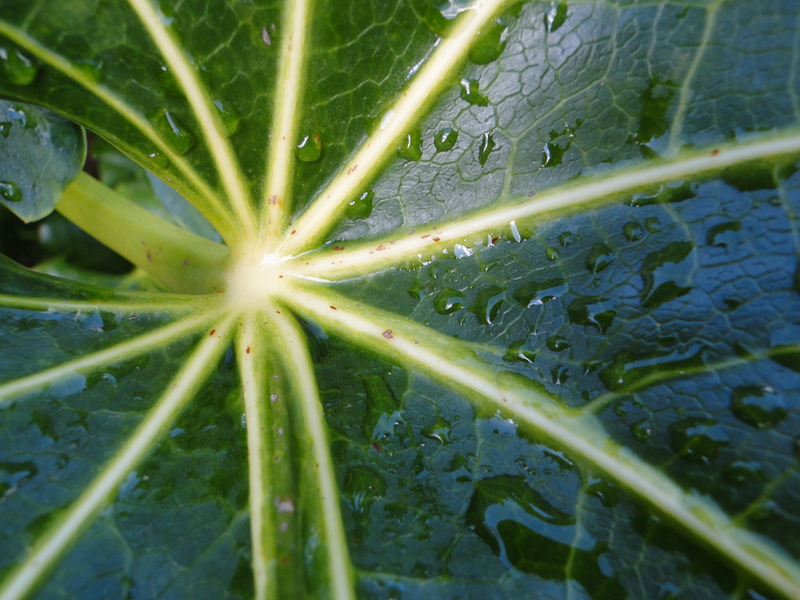 Then there is Arum italicum which unfurls new spear-like leaves now. 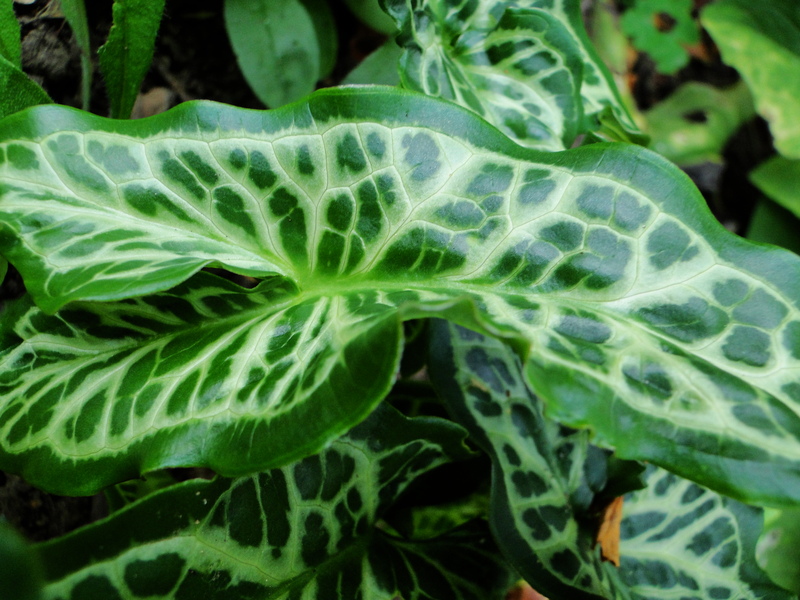 It seems such a strange thing to do, as the rest of the garden slips into dormancy to withstand the worst of the winter weather, this little plant decides to poke out from the soil, with it’s intriguing marbled foliage. 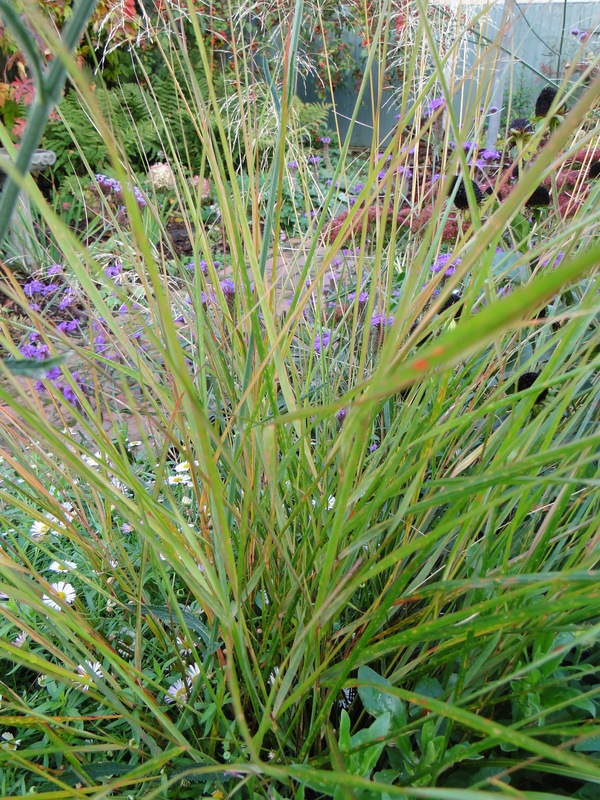 I love this grass, Anemanthele lessoniana and how it’s leaves turn from green to beautiful autumnal colours as season progresses. If they move in the wind they look like the flickering flames in my woodburner. I think fatsias are great plants. The beautiful glossy, dark green leaves and the cream ribs provide a great contrast at this time of year. If every plant in the garden was turning orange and red the eye wouldn’t be able to appreciate them, so a little green helps these plants stand out. 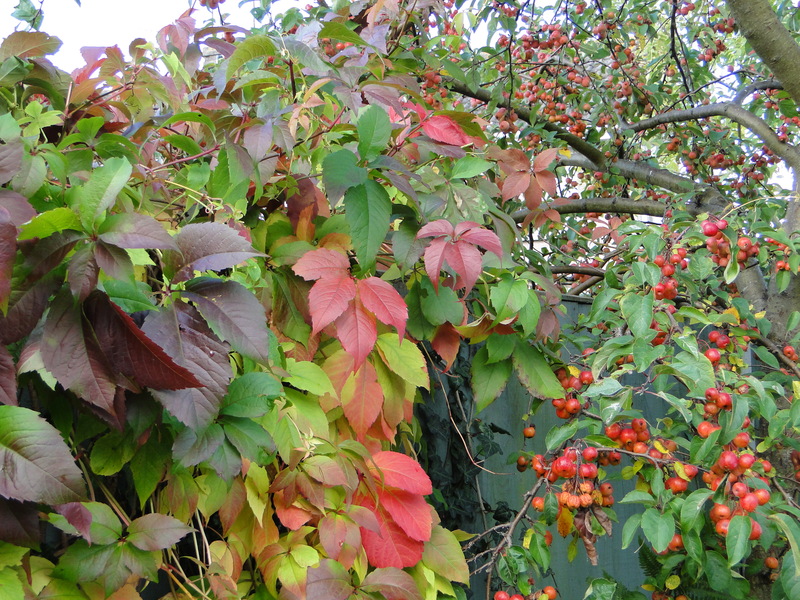 Then there is Parthenocissus or Virginia Creeper which has turned my fence into a smouldering mix of reds, oranges and yellows. Well I suppose that lovely Autumn weather had to end at some point. Warm sunshine has been replaced by torrential rain and it’s so dark I need the light on at lunchtime. I’m even thinking about lighting the fire. So to cheer myself up I had a look through some old photos from garden visits. I love looking through my old gardening photos. I’ll come across somewhere I haven’t visited for a while and make a note to return their next year. 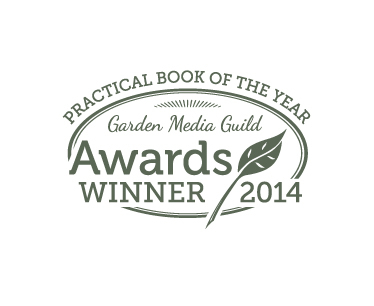 It’s also a good opportunity to have a look for inspiration for my own garden next year. 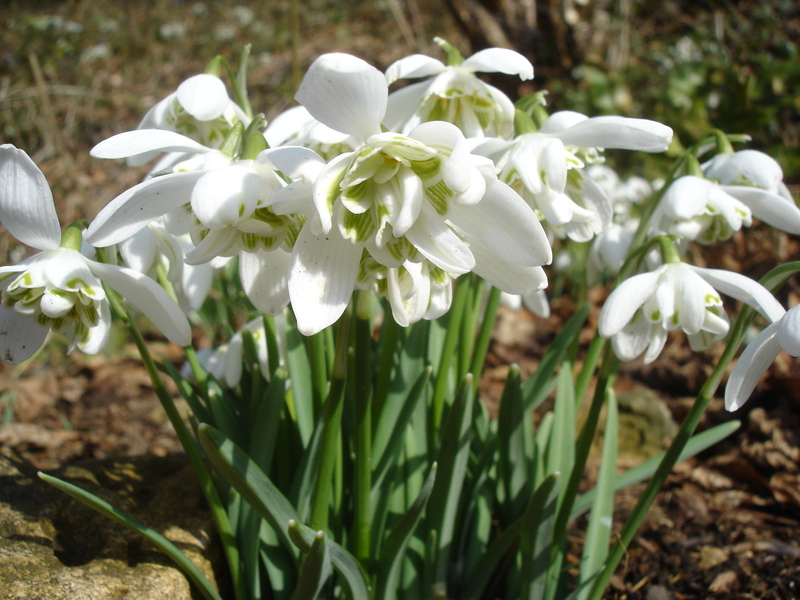 I visited Abbey House Gardens in Malmesbury, Wiltshire in the Spring of 2010. The owners are the famous ‘naked gardeners’ but don’t worry they’re not naked all the time. Although they do have special ‘clothes optional’ days if you would like to join them. The gardens are also famous for their tulip displays, one of the largest in the UK, they plant around 20,000 tulips every year. I don’t like having to plant 40 so I have great respect for their dedication, or could it be addiction. The garden lies in the shadow of Malmesbury Abbey and there is a medieval feel to the garden with its box edged borders and topiary, both providing a great background to the strident colours of the tulips. Don’t expect designer style planting though, there is no restraint in the colour palette. Once you get used to the fact that a red tulip might be planted in amongst pink tulips with some dark ones next door, then you can marvel at the sheer exuberance of the garden. Abbey House Gardens are not just about tulips though. There is an abundance of other bulbs and with over 200 varieties of fruit the gardens are smothered in blossom in Spring. There is an incredible laburnum tunnel, a good selection of roses and other plants providing interest throughout the year. There is also a beautiful river walk for something that bit more naturalistic. I would definitely recommend a visit. For more information go to www.abbeyhousegardens.co.uk. Normally, at this time of year I would be feeling like hibernating. I would reluctantly venture into the garden to do a spot of tidying up but feel a bit miserable that everything was dying back, entering a state of dormancy. I’ve noticed this year that I’ve been looking out more for points of interest. Ok we’ve had a lovely Autumn that means my garden still looks good and I’ve been out soaking up those last rays of sun but I do think this whole blog writing thing is making me look at my garden in a different way. So I just thought I’d share with you some photos of plants that are still doing their thing. 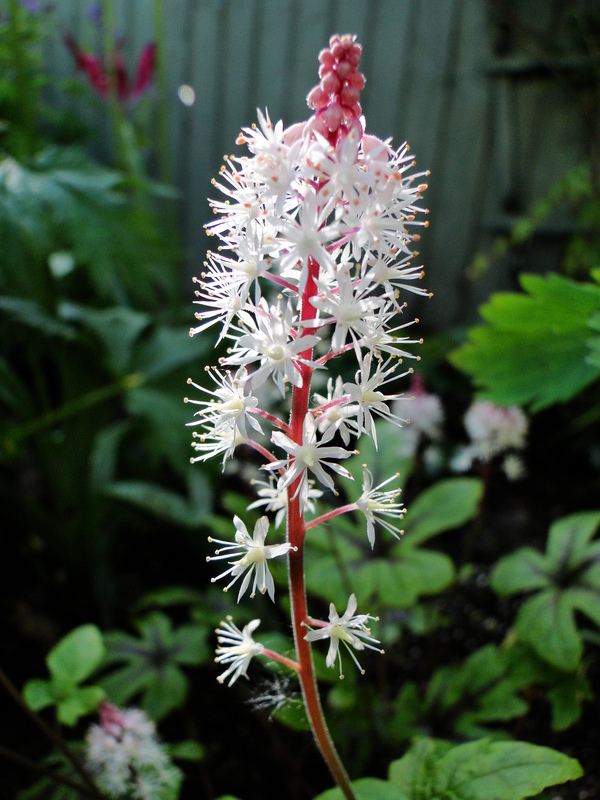 This is Tiarella ‘Morning Star’, a beautiful little plant that has been flowering since May. It has these lovely frothy pink flowers that are lightly scented and beautifully marked leaves. It likes part shade and I have it planted at the edge of my shady border so it doesn’t get swamped by other plants. 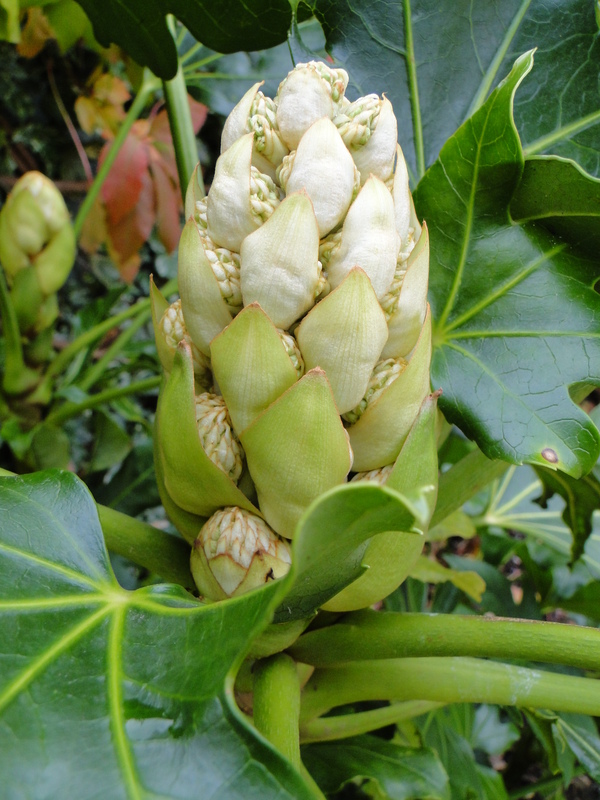 This is the flower head on my Fatsia. I love the foliage of Fatsias but this is the first year it will have flowered. It suffers a bit in the winter, it’s leaves go brown and it looks a bit sorry for itself but it always perks up in Spring. Sometimes new leaf buds get damaged by frost but I’ve found by removing the damaged buds it will send out fresh ones. 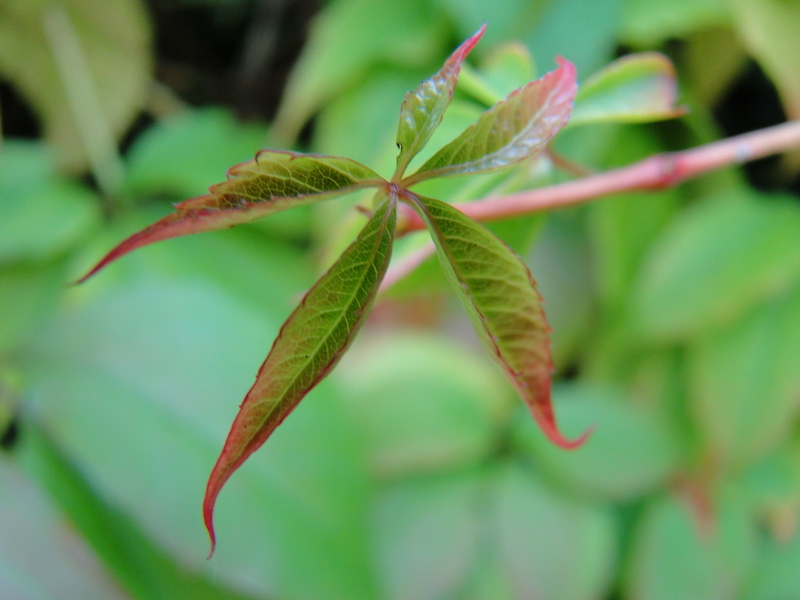 I loved this young Parthenocissus (Virginia Creeper) leaf tinged with Autumn colour. 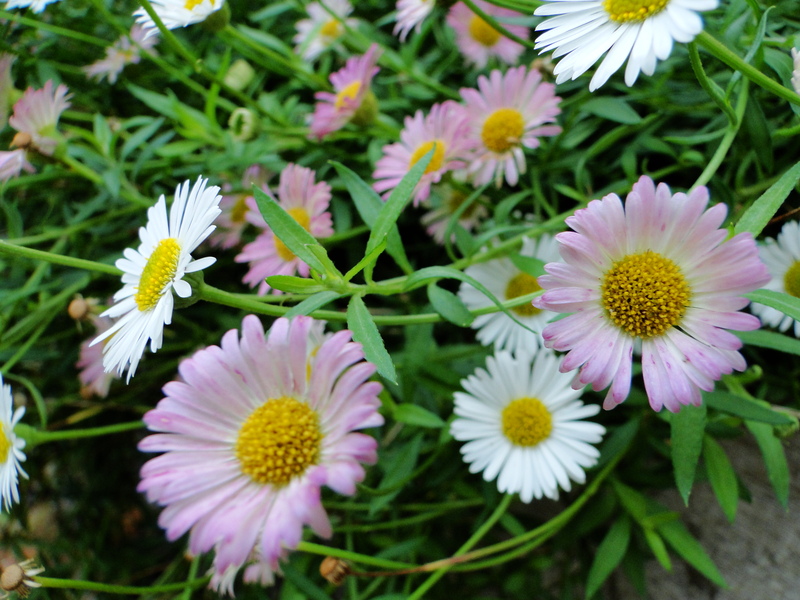 And finally my Erigeron karvinskianus that just keeps flowering. It probably isn’t a plant popular with garden designers, I’m not sure it would make the ‘What’s hot at Chelsea’ list but I love it. It reminds me of holidays in Cornwall where it grows in crevices of walls, tumbling down in a slightly straggly fashion. In the garden with more soil and nutrients it makes a more bushy, healthier looking plant but still produces masses of flowers over a long period. Last winter did hit it quite hard and it took longer to get going again in Spring but it is really easy to grow from seed. I have it planted at the edges of my oak raised beds so it tumbles over softening the edges and also at the base of a Clematis that is growing up the side of the shed. I wanted something around the base of the clematis to keep the roots cool and the Erigeron has done the job well. Another job on my ‘Autumn to do’ list was spreading my leaf mould. I checked it the other day and it looked ready. I don’t have enough leaves in the garden so I collect extra from the local area stuffing it into old compost bags and bringing it home. Leaves take longer to rot down than other forms of green waste. You can put a small amount into your compost heap but it’s best to compost them separately. If you leave it for a year it should have broken down enough to be used as a mulch on the garden borders. 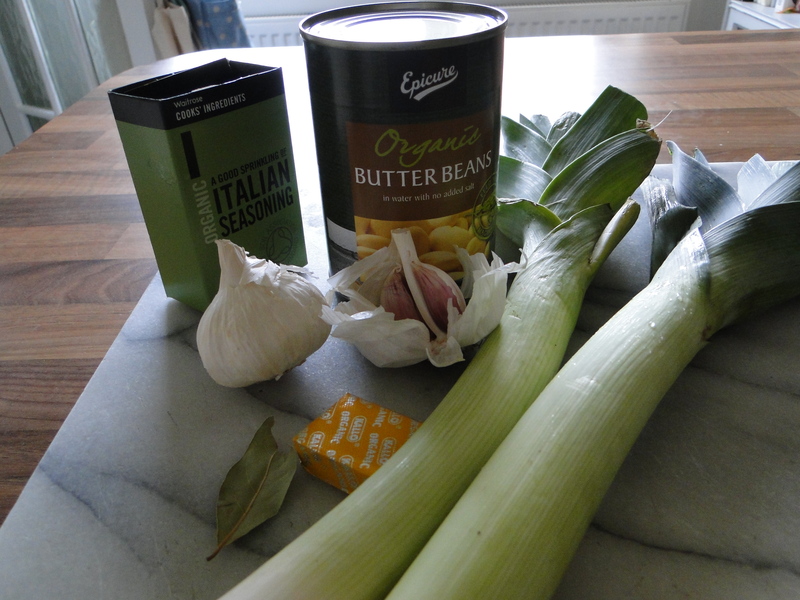 If you leave it for longer it will break down into a really fine consistency that can be used in potting compost mixes. I’ve tried several types of container over the last few years. The first year I tried black bin liners. I just stuffed the leaves inside, punctured the bag with a fork to allow air into the leaves and left them behind the shed. I found that they would dry out very quickly and they decompose best when kept moist. I also didn’t like the idea of using the bin liners. 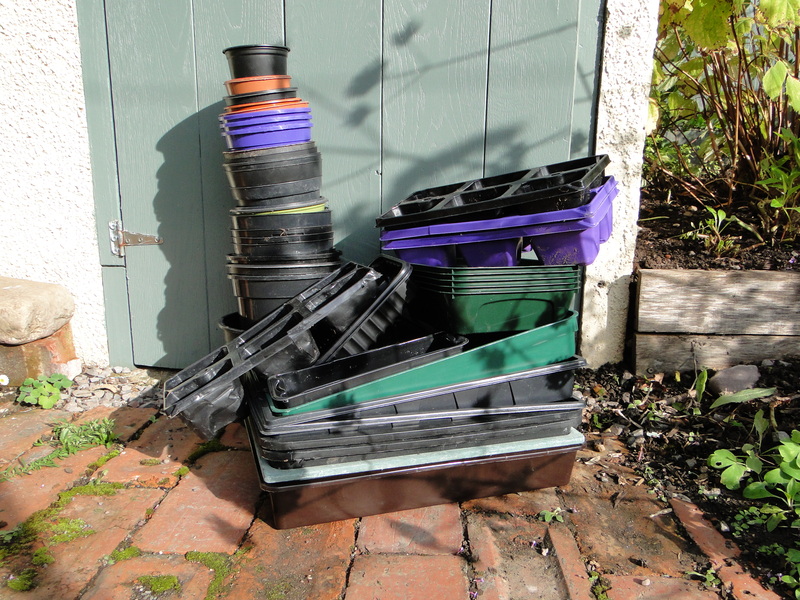 They were in quite a state by the time the leaf mould was ready for use, covered in mud and just quite grotty but I didn’t want to use new bags every Autumn, not very environmentally friendly. So the second year I bought some of the biodegradable leaf sacks. Again these dried out quickly but it was easier to keep them moist by just putting the hose on them. Unfortunately they degraded too quickly, so by the Spring the sack were already falling apart but the leaves needed another 6 months before they would be ready. By the time I came to use the leaf mould there were patches of the sack left but nothing holding the leaves in place. So last year I bought 2 small recycled plastic dustbins from B&Q and drilled a few holes in the base and around the lower half of the bin and then filled these up. They’ve worked much better. They do take up a bit more space but it’s much easier to get a fork in and turn the leaves and they don’t dry out as quickly. It’s also simpler to just put the hose into the bin to add some moisture but best of all I don’t need to buy any sort of sack each Autumn. I’m using my leaf mould as a soil conditioner for my shady border and also as a sort of duvet on a couple of plants that I think might suffer from the cold. I don’t have the space to dig them up and overwinter them so I’m hoping a thick mulch will give them enough protection over winter. I’m always amazed when I’m tidying up in Spring and removing debris from the soil, that just a few leaves and bits of dead plant has been enough to protect little creatures such as ladybirds from temperatures as low as minus 17. So hopefully it will offer the same protection for my plants. 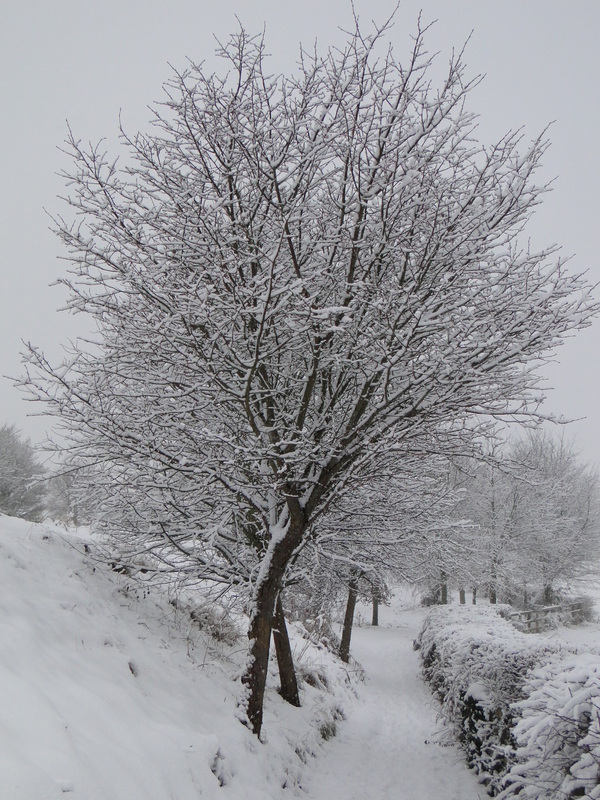 After a weekend off I knew there was a long list of jobs that needed tackling before the weather turns. So first thing Monday I went up to the plot and pulled out the cutflowers. The Zinnias, Rudbeckias and Calendulas all went on the compost heap and I lifted the dahlias to put in the shed to dry off. I’ve just left a couple of Asters because the bees are still enjoying them. I sowed some more green manure. The packet said it was ok to sow up until November so hopefully they’ll germinate. Although the daylength is shortening and it looks like we might have a frost this week the ground is still warm so hopefully that will be enough for germination. The weeds are certainly still growing. And then the bulb planting started. I know all the books say you shouldn’t plant your Tulips until November to prevent them getting viruses but by November the weather normally makes it difficult to work the soil. Either it’s too wet or too hard after a frost. I’m always intrigued by the idea that you should plant your shallots on the shortest day, December 21st. Firstly, who has time 4 days before Christmas to be planting shallots and secondly, and most importantly, when are the conditions right for this to happen. Personally, if I was a shallot I wouldn’t appreciate being shoved in some cold wet soil. Also, Wellyman has had cold all week, so anticipating that I might catch it I just thought I’d make the most of a sunny day and get planting. No Narcissi this year, we have quite a lot already but there was Anemone coronaria, Gladiolus colvillei ‘The Bride’, Tulipa hageri ‘Little Beauty’, Tulipa ‘Odalisque’ and some free bulbs Tulipa ‘Ronaldo’. I planted the Anemone at the allotment after soaking them overnight. With all the bulbs I added a small handful of grit to the planting hole. My soil isn’t particularly clayey but we do get very wet winters so I think they’ll benefit from that bit extra drainage. I also planted the Gladioli at the allotment. 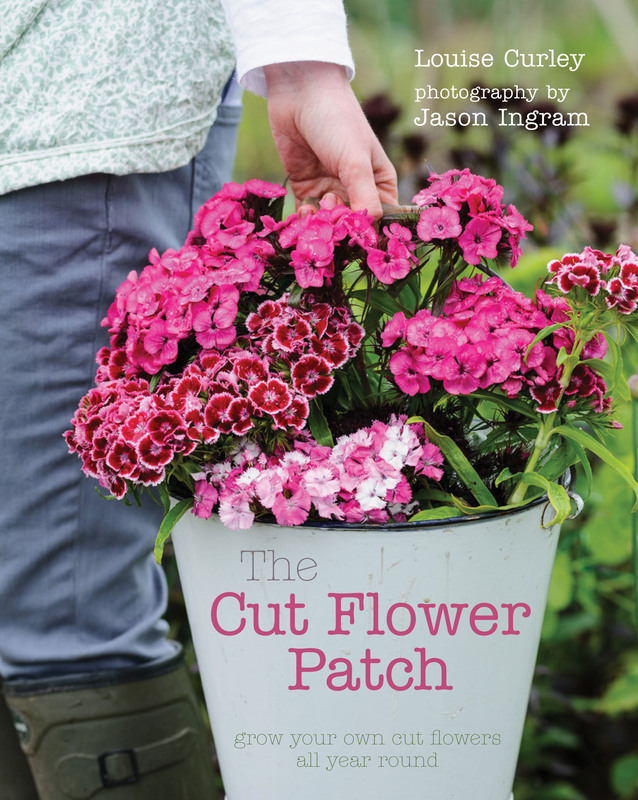 They are a hardy species variety which make a good cut flower apparently. I decided to buy some of the smaller species Tulips this year. I saw a lot at Abbey House Gardens last year (a must see for Tulip lovers) and loved them. I also read that they are more perennial than the bigger Tulips and will slowly form a colony. I do love the bigger Tulips and some do come back year after year but most, I find, start to dwindle in numbers. I know some people treat them as annuals but I can’t bring myself to spend a lot of money on them every year. So I thought I’d give the species one a try but as a bonus I got a free gift of 15 Tulipa ‘Ronaldo’ which is a deep carmine red. I don’t like bulb planting. The soil is hard work in some parts of my garden but we had some rain the previous night which made the ground more workable. 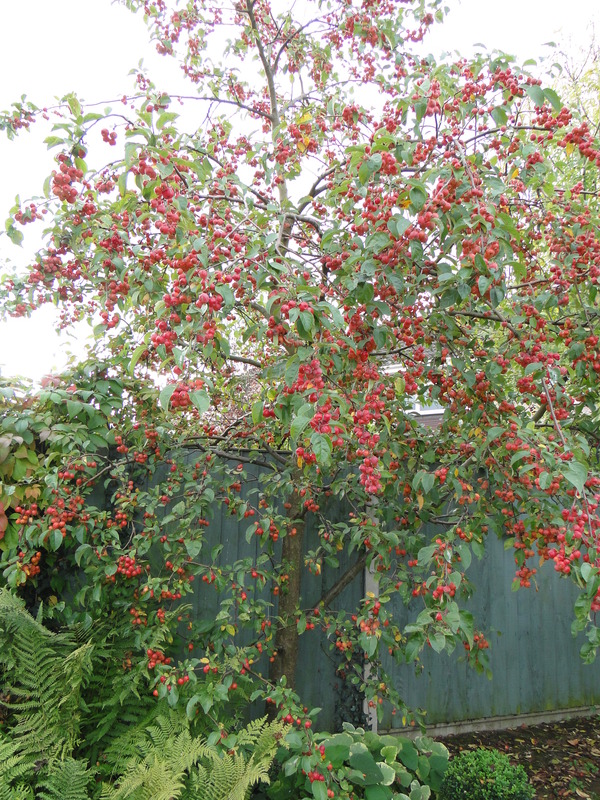 But all the hard work will pay off next spring with, hopefully, a beautiful display. I got my bulbs from Sarah Raven. She trials all her varieties and gives good informative advice in her catalogue and online.